Try this stunning recipe at your next drink's party - they are ideal as you can prepare most of it in advance. 1. Place 50g of the butter in a bowl and whisk over a pan of simmering water until softened. 2. Remove the bowl from the heat and whisk in the soured cream and cream cheese. 3. Put the bowl back over the pan of simmering water and whisk in the remaining butter until fully incorporated. 4. The mixture may appear to split, but keep whisking over the pan of warm water and it will come back together. 5. Stir in the lemon juice and salt and decant into a small bowl. Keep in the fridge until required, or for up to 2 days. 1. Slice the cucumber lengthways down the middle, then slice very thinly on a mandolin or in a food processor. 2. Bring the sugar, vinegar and 150g cold tap water to the boil in a small saucepan over a medium heat. Allow to cool. 3. Chop most of the dill and mix with the sliced cucumber and pickling liquid in a container, cover and allow to marinate in the fridge for at least 30 minutes. 4. Drain the cucumber. Sprinkle with the extra dill, chopped, and salt to serve. Keeps for up to a week in the fridge. 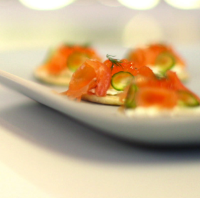 Top the blinis with the soured cream butter then add some smoked salmon, pickled cucumber, a little bit of salmon roe then finish with some dill.